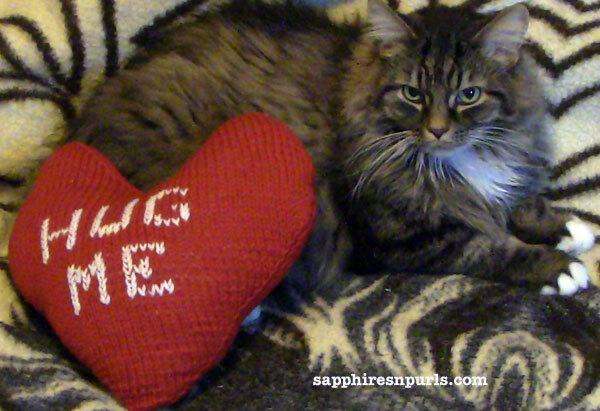 Here is one of my cats, Tiger, modeling the Pillow Talk Valentine's Day Pillow! This is a quick, easy project. I used Christmas Red and White Cascade 220 yarn, but you can use any colors you like. The heart used about 160 yards of yarn total. This is stuffed with polyester poly fill; I put as much in as I could, which is about 2 oz. but you can use more or less. The letters are added with duplicate stitch using a few scant yards of scrap yarn. If you don't know how to do duplicate stitch, you can find a video on my YouTube Channel. The pattern is available for purchase from my Craftsy store. The charted letters are included with the pattern. Click on the picture below to go directly to my Craftsy store and purchase the pattern. 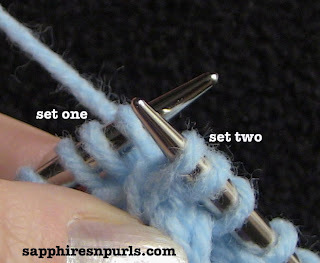 Cabling without a cable needle (or DPN, or whatever you may use to cable) is a handy trick to have in your knitting arsenal. Suppose you forget to pack your cable needles - you can still work on your project! This is particularly useful when making small cables also. Who wants to fuss with a cable needle to cross only two or three stitches? Of course, if you feel comfortable only using a cable needle, there is nothing wrong with that. 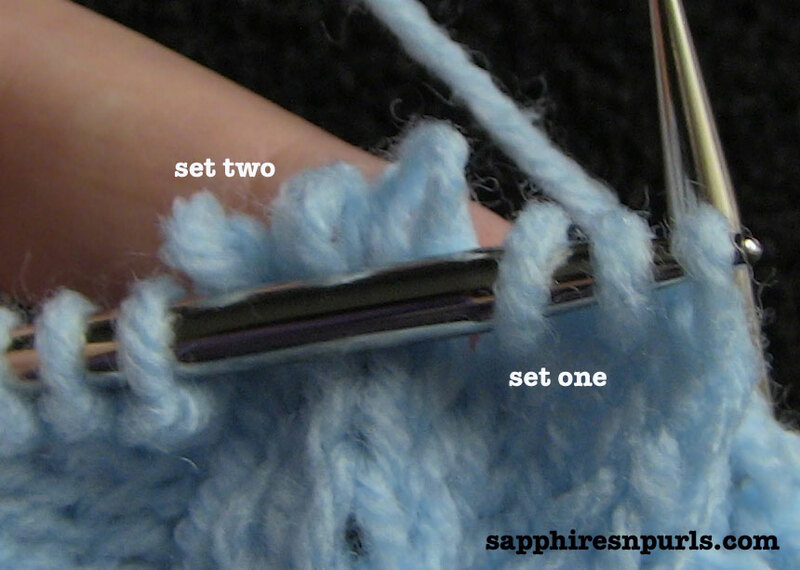 If you like cables, but the idea of messing around with a third needle doesn't sound like fun, then give this technique a try. It really is very easy to do! Probably the biggest cable I would do this with is an eight stitch cable - any more than that might get a bit tricky. Go with whatever you feel comfortable with. 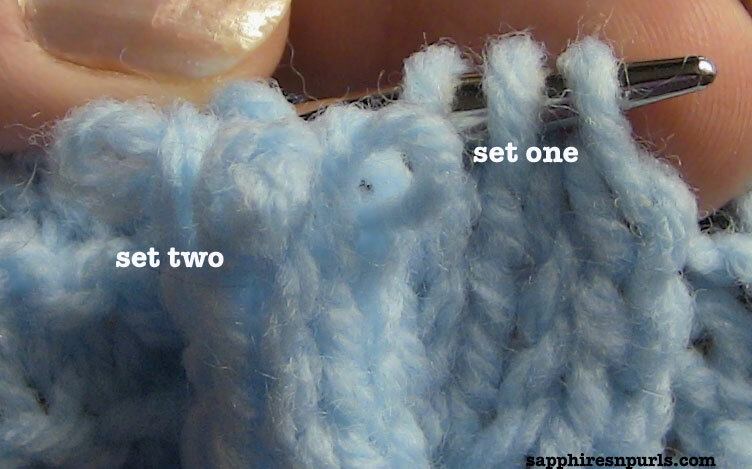 Slip the designated number of stitches from your left needle. For our example, we are doing a 6 stitch cable, so slip six stitches off your left needle. The first three stitches are Set One. The last three stitches are Set Two. 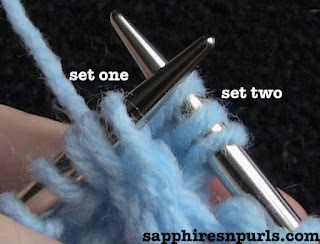 With the left needle, reach BEHIND Set Two and slip Set One back onto the left needle. Now, grab Set Two with your right needle and slip them back onto the left needle. Proceed with your knitting. Slip the designated number of stitches from your left needle. Again, let's use 6 as an example. 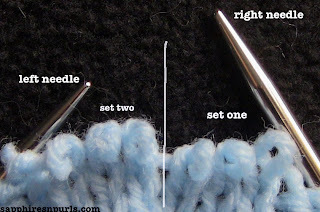 With the left needle, reach IN FRONT of Set Two and slip Set One back onto the left needle. Doesn't that sound easy? If not, don't worry. It made no sense to me the first time I read these instructions either. After reading the instructions a few more times, I sort of had it. Then, after actually trying it out, I had this down! Now I almost never use a cable needle. Again, you should do whatever is most comfortable for you. Here is a video to help if you are more of a visual learner. If you've tried machine felting, and would like to embellish your item, give needle felting a try. 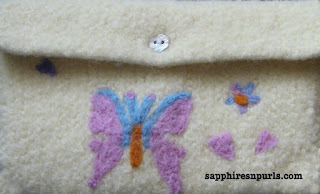 It is quick and easy to add a little something to a plain felted bag, like I did in the picture above. Clover makes a variety of molds and needle felting tools that you can find in many craft and yarn stores, or online. I will show you these things in the video, or you can go to the Clover website and see what they have. Also check out what Knit Picks has to offer. Needle felting is not just for embellishing; you can even create figures! Check out my amazon store for tools and books on needle felting. I say this in the video, and want to reiterate here. The needles used for felting are very, very, extremely SHARP!! You should be very careful while using them; this is not something I recommend for young kids. Adults only, and please be careful!! Here is my little video. Happy Needle Felting!